As firefighters continue to battle the Camp Fire in Northern California, NASA shared its view of the damage and it’s pretty grim. The fire has become the most destructive in California’s history. The map comes courtesy of the Advanced Rapid Imaging and Analysis (ARIA) team at NASA’s Jet Propulsion Laboratory in Pasadena, California, which used aperture radar images from the Copernicus Sentinel-1 satellites operated by the European Space Agency. They created the map by comparing before-and-after satellite images of a 48 x 48 mile stretch of Northern California. 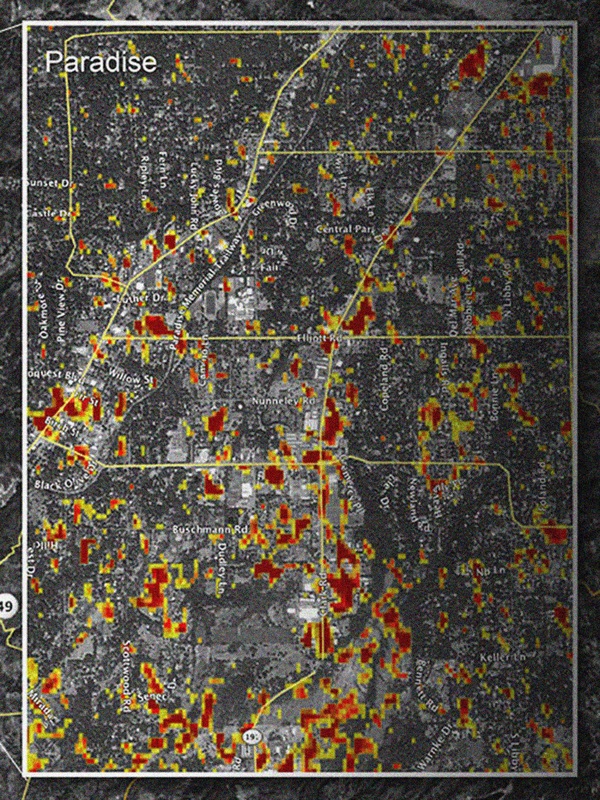 The changes in the map reveal the extent of the fire’s damage, outlined in red on the left. A close-up view of damage to the town of Paradise is inset on right, outlined in white. The color variation from yellow to red indicates increasingly more significant changes in the ground surface. As you can see, the damage is extensive. The Camp Fire has killed at least 79 people, and while heavy rain this week could help put out the remaining fires, the recovery is just beginning. If you’re looking to help, here are 19 things you can do for victims of the California fires right now.